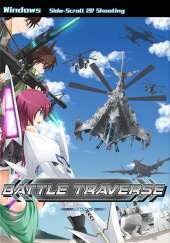 This is a horizontally scrolling shooter that takes place in the year 2038, where a group rebel forces called Luciana have taken over a secret island in the Pacific Ocean. According to information from the reconnaissance satellites, they seem to be preparing a battle regime. Fifteen years ago, the United Nations set up an artificial island to produce weapons for their purposes. The player is one of the members of Tenable Defensive Justice, a special force aimed at defeating terrorists with sophisticated weaponry. The player chooses one of three different pilot and must destroy enemy aircraft, tanks and ships using both guns and a limited supply of bombs which damage or destroy all enemies on-screen when used. The game spans over five stages, where each level consists of mid-boss and ends with a boss fight.